As we continue a dry winter, we look to history to provide some sort of hope. While there have been some significant snow events this week in Denver weather history, more common is bitter cold and damaging winds. In 1962…a protracted cold spell kept metro Denver in the deep freeze for more than a week. From the 15th thru the 23rd…low temperatures were zero or below for 9 consecutive days…but a daily record low was set only on the 22nd when the temperature dipped to 14 degrees below zero. A record low maximum for the date was also set on the 22nd when the temperature climbed to only 11 degrees. The coldest high temperature was 3 degrees above zero on the 21st…which did not break the record. The protracted cold was broken for only a few hours on the afternoon of the 20th when Chinook winds warmed the temperature to a high of 38 degrees before another surge of cold arctic air plunged temperatures back into the deep freeze that evening. The severe cold caused much damage to water systems. A woman was frozen to death at Morrison. There were other deaths attributable to the weather…including traffic deaths and heart attacks from overexertion. In 1911…a trace of rain fell…a rare event in January. In 1935…rainfall was 0.01 inch during the afternoon…a rare event in January. In 1989…wind gusts to 80 mph were reported in southwest Boulder. Winds reached 100 mph at Rollinsville in the foothills southwest of Boulder. In Golden…the wind blew a 25-foot trailer through a fence and flipped it over. West winds gusted to 37 mph at Stapleton International Airport where the Chinook winds warmed the temperature to a high of 49 degrees. In 1886…a brief cold spell resulted in two temperature records. High temperatures of zero degrees on the 16th and 2 degrees below zero on the 17th were both record low maximums for the dates. Low temperatures of 8 degrees below zero on the 16th and 16 degrees below zero on the 17th were not records. In 1930…temperatures plunging well below zero resulted in two records. Low temperatures of 19 degrees below zero on the 16th and 20 degrees below zero on the 17th were record low temperatures for the dates. High temperatures were 4 degrees on the 16th and 15 degrees on the 17th. Light snowfall totaled 4.0 inches. North winds were sustained to 18 mph on the 16th. In 1964…high winds struck the eastern foothills. Gale velocity winds were recorded in Boulder with gusts to 83 mph measured at Rocky Flats. Several airplanes were damaged at the Jefferson County Airport in Broomfield. Roofs…walls…and parts of buildings were blown away at various locations. Power poles and trees were blown over. In 1943…light snowfall totaled 3.2 inches over the 3 days. This was the only measurable snow of the month. North winds were sustained to 20 mph on the 16th. In 2011…very strong winds associated with an upper level jetstream over Colorado produced blizzard conditions in the mountains above timberline. Peak wind gusts included: 99 mph atop Loveland pass…94 mph…2 miles southwest of Mary Jane…80 mph atop Berthoud Pass and 79 mph atop Niwot Ridge. Storm totals in the ski areas west of Denver ranged from 8 to 14 inches. In 1890…north winds were sustained to 48 mph with gusts as high as 60 mph behind an apparent cold front. Light snow also fell. In 1932…a large cumulo-nimbus thunderhead was observed in the eastern sky at 4:00 pm. Thunderstorms are relatively rare in February. In 1990…northwest winds gusted to 52 mph at Stapleton International Airport. The strong Chinook winds warmed the temperature to a high of 56 degrees. In 1999…a vigorous cold front moved a wall of blowing dust across the plains of northeastern Colorado during the afternoon and early evening hours. While the strongest winds and wind damage were north and east of metro Denver… North to northeast winds did gust to 48 mph at Denver International Airport…reducing the visibility to as low as 3/4 mile in blowing dust. The temperature dropped as much as 15 degrees in 5 minutes and 21 degrees in 30 minutes following the passage of the cold front. Dangerous wind shear conditions at DIA delayed several flights…while others were redirected to Colorado Springs. In the Montbello area of northeast Denver…the strong winds blew the roof off a building. Downed power lines sparked a small brush fire…which burned about 10 acres near the former Fitzsimmons Army Medical Center. In 1971…a wind gust to 80 mph was recorded in Boulder at the National Center for Atmospheric Research. A wind gust to 69 mph was measured at the National Bureau of Standards. In downtown Boulder wind gusts to 43 mph were clocked. No damage was reported. North to northwest winds gusted to 39 mph on the 10th and to 41 mph on the 11th at Stapleton International Airport. In 1999…heavy snow developed over sections of metro Denver during the evening hours. Snowfall totals included: 6 inches at Eaglecrest…6.5 inches at Highlands Ranch…and 8.5 inches about 5 miles south of Sedalia. Only 1.0 inch of snow fell at the site of the former Stapleton International Airport. Strong winds and snow caused near blizzard conditions north of metro Denver. In 1958…heavy snow fell across metro Denver. At Stapleton Airport…where northeast winds gusted to 22 mph…6.7 inches of snowfall were measured. In 1995…cold arctic air brought heavy snow to the foothills and western Denver suburbs. Golden measured 15 inches of snow with 14 inches in south Boulder. Locations in the foothills recorded between 10 and 15 inches of snow. Only 6.1 inches of snow fell at Stapleton International Airport where north winds gusted to 30 mph on the 10th. In 1905…an extremely cold arctic air mass moved over the city behind a cold front on the 10th and persisted through the morning of the 13th. North winds were sustained to 25 mph behind the front on the 10th dropping the temperature to a low of 2 degrees below zero…which was also the high reading on the 11th. Light snowfall totaled 3.0 inches overnight of the 10th into the 11th. The low temperature plunged to 19 degrees below zero on the 11th. Records were set on the 12th and 13th. The high temperature of only zero degrees on the 12th was a record low maximum for the date. The low readings of 21 degrees below zero on the 12th and 14 degrees below zero on the 13th were record minimum temperatures for those dates. In 1875…northwest winds were brisk all day. The velocities increased to 30 to 50 mph during the early evening. In 1957…Chinook winds gusting to 49 mph warmed the temperature to a high of 64 degrees at Stapleton Airport. In 1971…a rare February thunderstorm produced 1/4 inch diameter hail in southwest Denver. In 1981…the cold spell of the 10th came to a quick end with strong Chinook winds. Gusts to 84 mph were recorded at Mines Peak and to 80 mph at Wondervu. Gusts in the foothills ranged from 50 to 65 mph. Southwest winds gusted to only 23 mph at Stapleton International Airport. In 1984…a near-blizzard across eastern Colorado closed I-70 east of Denver and stranded 1200 motorists at Limon. Only 0.9 inch of snow fell at Stapleton International Airport where north winds gusted to 43 mph. In 1988…wind gusts to 77 mph were measured at Echo Lake. West winds gusted to only 32 mph at Stapleton International Airport. In 1899…the temperature plunged to lows of 20 degrees below zero on both days. In 1900…northwest winds sustained to 52 mph with gusts to 60 mph warmed the temperature to a high of 58 degrees on the 11th. An apparent cold front overnight produced 3.7 inches of snow and northeast winds gusting to 30 mph. The high temperature on the 12th was only 26 degrees. In 1994…moist upslope winds and an upper level storm system produced heavy snow over western portions of metro Denver. Snowfall amounts totaled 10 inches in Golden and 8 inches at Strontia Springs Reservoir 15 miles southwest of Denver in the South Platte Canyon. Snowfall at Stapleton International Airport totaled only 3.6 inches…but north winds gusting to 35 mph on the 11th produced occasional visibilities as low as 1/4 mile in heavy snowfall and blowing snow. In 1903…west to northwest Chinook winds gusting to 34 mph warmed the temperature to a high of 50 degrees on the 11th… Before temperatures rapidly plunged to a low of 14 degrees behind a cold front. Light snow fell through the 13th and totaled 4.2 inches in the city…while temperatures ranged from a high of 14 degrees on the 12th to a low of 5 degrees below zero on the 13th. In 1874…5 inches of snow fell in downtown Denver. Melted snow resulted in 0.31 inch of precipitation. In 1875…forest fires burned very brightly in the foothills to the west of Denver. 12-13 in 1915…heavy snowfall totaled 7.0 inches over downtown Denver. Northwest winds were sustained to 24 mph on the 13th. In 1951…heavy snowfall totaled 8.1 inches at Stapleton Airport where northeast winds gusted to 28 mph on the 12th. In 1968…snowfall totaled 5.6 inches at Stapleton International Airport where northeast winds gusted to 26 mph. Snow fell all day on the 12th and into the morning hours of the 13th. In 1997…heavy snow fell in the foothills southwest of Denver. Conifer…Evergreen…Morrison…and North Turkey Creek received 6 to 8 inches of new snow overnight. Only 0.2 inch of snow fell at the site of the former Stapleton International Airport. North-northeast winds gusted to 23 mph at Denver International Airport on the 13th. In 1886…northwest winds were sustained to 40 mph during the early morning hours…but winds were strong and gusty all day. In 1918…west winds were sustained to 42 mph with a measured extreme velocity to 44 mph. The strong Chinook winds warmed the temperature to a high of 58 degrees. In 1988…high winds raked metro Denver. Boulder reported a wind gust to 67 mph with 63 mph at Lakewood and 49 mph at Stapleton International Airport. The strong winds toppled a tree onto a car in Aurora. Northwest winds gusting to 49 mph at Stapleton International Airport warmed the temperature to a high of 64 degrees. In 2010…a peak wind gust to 89 mph was recorded in Boulder. North winds gusted to 28 mph at Denver International Airport. In 1895…a cold air mass settled over the city. High temperatures of only 4 degrees on the 13th and 8 degrees on the 14th were record low maximum temperatures for each day. Low temperatures were 6 degrees below zero on the 13th and 5 degrees below zero on the 14th…but were not records. Light snow totaled only 0.4 inch. Winds were light. In 1960…snowfall totaled 6.1 inches and north-northwest winds gusted to 39 mph at Stapleton Airport. In 1967…high winds were widespread along the foothills where wind gusts of 60 to 90 mph were common. A wind gust to 108 mph was measured at the National Center for Atmospheric Research in Boulder. Sustained winds of 50 to 55 mph with gusts as high as 70 mph were recorded in downtown Boulder. An estimated 3 thousand dollars in damage occurred to mobile homes in Boulder. Power lines were downed over a wide area. At Stapleton International Airport…west winds gusted to 32 mph on the 13th and southwest winds gusted to 48 mph on the 14th. In 1972…winds gusted to 67 mph at the National Bureau of Standards in Boulder. Wind gusts to 49 mph were measured in downtown Boulder. West winds gusted to 26 mph at Stapleton International Airport. In 2001…heavy snow fell across metro Denver and in the foothills. Snowfall totals included: 8 inches at Evergreen; 7 inches atop Crow Hill and in Lakewood; 6 inches in Denver…Doubleheader…Eldorado Springs… Morrison…and Pine Junction. Snowfall totaled 4.8 inches at the site of the former Stapleton International Airport. Northeast winds gusted to 33 mph at Denver International Airport on the 13th. In 1918…southwest winds were sustained to 41 mph with a measured extreme velocity to 46 mph. In 1987…metro Denver received only 3 to 4 inches of snow… But the foothills west of Boulder received up to 11 inches of snow. Snowfall totaled 4.2 inches at Stapleton International Airport where north winds gusted to 31 mph. In 1988…winds gusted to 81 mph at Echo Lake. In 2002…high winds developed in the Front Range foothills during the early morning hours. Winds gusted to 84 mph… 11 miles north of central city. West winds gusted to 43 mph at Denver International Airport. In 1960…heavy snowfall totaled 6.1 inches at Stapleton Airport. In 1965…5.4 inches of snow fell at Stapleton International Airport behind a cold front. North-northeast winds gusted to 32 mph. Winds were strong and gusty all day and caused considerable blowing snow…contributing to hazardous driving conditions mainly to the east of Denver. In 1984…a snow and wind storm howled across eastern Colorado closing I-70 east of Denver. This was the second blizzard in less than 4 days. Only 0.5 inch of new snow fell at Stapleton International Airport…but north winds gusted to 51 mph. In 1881…the temperature plunged to a low of 20 degrees below zero in the city. In outer areas of the city…the temperature dipped to 26.5 degrees below zero. In 1910…west winds were sustained to 42 mph. In 1986…high winds battered the Front Range foothills. A wind gust to 95 mph was recorded in Boulder…but winds of 60 to 80 mph were common in and near the foothills. In Aurora…an automobile dealership lost a large plate glass window. Southwest wind gusts to 44 mph were recorded at Stapleton International Airport. The strong winds warmed temperatures. A record maximum temperature of 66 degrees and a record high minimum temperature of 37 degrees were recorded at Stapleton International Airport. In 1988…winds to 75 mph were clocked in Boulder…while a west wind gust to only 41 mph was recorded at Stapleton International Airport. In 1997…winds gusted to 75 mph at Golden Gate Canyon during the early morning hours. West winds gusted to 31 mph at Denver International Airport. In 2000…high winds spread from the foothills onto the plains. While the strongest winds were north and northeast of metro Denver…west winds gusted to 58 mph in Thornton and to 54 mph at Denver International Airport. In 2005…light precipitation of only 0.02 inch at Denver International Airport and 0.5 inch was the only measurable snowfall of the month. This ranked the month as the 2nd driest February of record. In 1889…heavy snowfall totaled 6.7 inches in downtown Denver. Most of the snow…5.5 inches…fell on the 15th when northeast winds were sustained to 18 mph. In 1921…strong bora winds cooled maximum temperatures from the 60’s on the previous 3 days to 54 degrees on the 15th and to 43 degrees on the 16th. West winds were sustained to 39 mph with gusts to 54 mph on the 15th and to 46 mph with gusts to 56 mph on the 16th. In 1953…strong…cold northwest winds were widespread from the foothills across the plains. Near gale force winds were observed in Boulder. A wind gust to 54 mph was recorded at Stapleton Airport where blowing dust briefly reduced the visibility to 1 1/2 miles. Damage was minor. In 1993…an arctic cold front pushed south over the eastern Colorado plains with upslope snow developing behind the front. Snowfall amounts of 3 to 6 inches were common over metro Denver. At Stapleton International Airport…snowfall totaled 4.5 inches and north winds gusted to 25 mph. Temperatures hovered only in the single digits for most of the day. The storm produced up to a foot of snow over southeast Colorado. In 2006…overnight snowfall in the mountains and eastern foothills contained a lot of red dust and dirt apparently from Arizona. Strong southwest winds with gusts to 100 mph in the San Juan Mountains on the 15th created widespread blowing dust. This red dust became entrained in snowfall across the area. The reddish colored snow was reported in Ward…Nederland…Blackhawk…and Boulder. The storm produced only 0.9 inch of snowfall in the Stapleton area of Denver with 4 to 5 inches measured in the foothills. 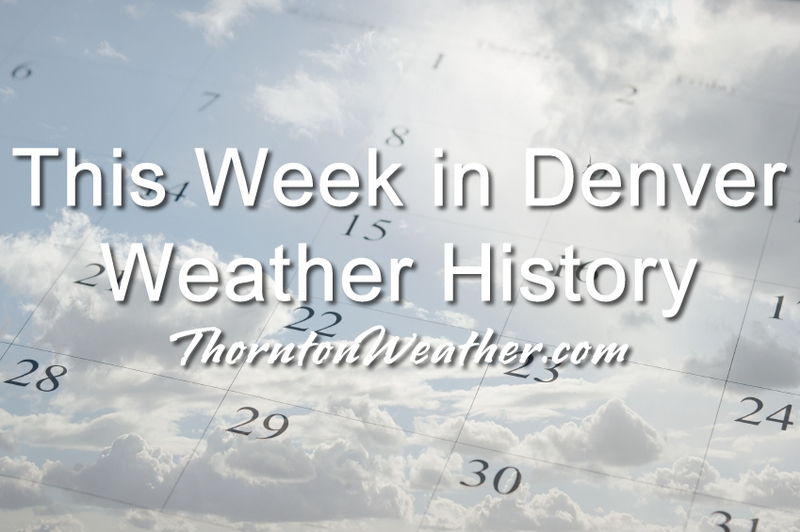 In 1938…a cold air mass brought a light snowfall of 6.2 inches over 3 days to downtown Denver where northeast winds were sustained to 18 mph on the 15th. In 1879…a sudden burst of 3 inches of snow in less than 90 minutes stopped the street cars in downtown Denver during the late afternoon. Melted snow resulted in 0.16 inch of precipitation. Small soft hail also fell when the snow began. A gentleman caught on the prairie between Denver and Morrison described the event as the most severe storm of the winter while it lasted. In 1885…a windstorm caused severe damage in the city. The strong winds blew all afternoon and most of the evening. West winds were sustained to 62 mph. The strong winds blew down signs and broke windows. Buggies and vehicles of all kinds were blown over. Smokestacks and chimneys were toppled. Roofs were blown off. The Denver and Rio Grande Railroad car shop was partially unroofed and had a wall blown down. Three railroad cars were blown off the track. Many fences were damaged. In 1897…west winds were sustained to 46 mph with gusts to 56 mph. In 1912…northwest winds were sustained to 44 mph with a measured extreme velocity to 45 mph. In 1921…west winds were sustained to 46 mph. In 1972…wind gusts to 58 mph were recorded at the National Bureau of Standards in Boulder. In downtown Boulder…a wind gust to 51 mph was measured. Northwest winds gusted to 41 mph at Stapleton International Airport. In 1988…snowfall totaled 3 to 6 inches across metro Denver… But 9 inches were measured in both Wheat Ridge and Evergreen. At Stapleton International Airport…3.4 inches of snow fell and northeast winds gusted to 26 mph. The strong winds blew a scaffold against a hotel in downtown Denver…breaking three windows. In 1995…high winds occurred in the foothills behind a departing winter storm. A wind gust to 91 mph was recorded at Rollinsville with a gust to 82 mph atop Squaw Mountain west of Denver. West winds gusted to only 20 mph at Stapleton International Airport. In 2014…a peak wind gust to 59 mph…from the west…was recorded at Denver International Airport. In 1929…strong west winds gusting to 84 mph raked Boulder and Lafayette. Limited minor damage and a few injuries occurred. In 1986…strong Chinook winds continued to howl in the foothills. A wind gust to 89 mph was recorded at Table Mesa in Boulder on the 16th. Winds of 60 to 75 mph were clocked at other locations in Boulder on both days. A west wind gust to 51 mph was recorded at Stapleton International Airport on the 16th. In 2014…high winds developed briefly overnight in and near the foothills of Boulder and Jefferson Counties. Peak wind reports included: 98 mph…4 miles north-northwest of White Ranch Open Space; 85 mph at the NCAR Mesa Lab; 78 mph at the Junction of Colorado Highways 93 and 172; and 75 mph just southeast of Morrison. A semi-truck and an SUV pulling a trailer were rolled over by the wind on Colorado 470 near Morrison. Strong winds damaged a home under construction in Lakewood. In 1970…a wind gust to 90 mph was recorded in Boulder at the National Center for Atmospheric Research. In downtown Boulder…sustained winds of 30 to 40 mph with gusts to 53 mph were measured. Damage was minor. West winds gusted to 45 mph at Stapleton International Airport on the 17th. The strong Chinook winds warmed the temperature to 70 degrees on the 16th and to 72 degrees on the 17th…both records for the date. The low temperature dipped to only 32 degrees on the 16th equaling the record high minimum for the date. This entry was posted on Wednesday, February 13th, 2019 at 5:07am MDT and is filed under Weather History. You can follow any responses to this entry through the RSS 2.0 feed. You can skip to the end and leave a response. Pinging is currently not allowed.